WEST LAFAYETTE, Ind. - A new technology enabling tiny machines called micro electromechanical systems to "self-calibrate" could make possible super-accurate and precise sensors for crime-scene forensics, environmental testing and medical diagnostics. The innovation might enable researchers to create a "nose-on-a-chip" for tracking criminal suspects, sensors for identifying hazardous solid or gaseous substances, as well as a new class of laboratory tools for specialists working in nanotechnology and biotechnology. "In the everyday macroscopic world, we can accurately measure distance and mass because we have well-known standards such as rulers or weights that we use to calibrate devices that measure distances or forces," said Jason Vaughn Clark, an assistant professor of electrical and computer engineering and mechanical engineering. "But for the micro- or nanoscopic worlds, there have been no standards and no practical ways for measuring very small distances or forces." The micro electromechanical systems, or MEMS, are promising for an array of high-tech applications. Researchers previously have used various techniques to gauge the force and movement of tiny objects containing components so small they have to be measured on the scale of micrometers or nanometers, millionths or billionths of a meter, respectively. However, the accuracy of conventional techniques is typically off by 10 percent or more because of their inherent uncertainties, Clark said. "And due to process variations within fabrication, no two microstructures have the same geometric and material properties," he said. "A 10 percent change in width can cause a 100 percent change in a microstructure's stiffness," Clark said. "Process variations have made it difficult for researchers to accurately predict the performance of MEMS." The new technology created by Clark, called electro micro metrology - or EMM - is enabling engineers to account for process variations by determining the precise movement and force that's being applied to, or sensed by, a MEMS device. "For the first time, MEMS can now truly self-calibrate without any external references," Clark said. "That is, our MEMS are able to determine their unique mechanical performance properties. And in doing so, they become very accurate sensors or actuators." Research findings were detailed in two papers presented in June during a meeting of the Society of Experimental Mechanics in Indianapolis and at the Nanotech 2010 Conference and Expo in Anaheim, Calif. The work is based at the Birck Nanotechnology Center in Purdue's Discovery Park. "Those MEMS work well because they don't need ultra-high precision or accuracy," Clark said. "It is difficult for conventional technology to accurately measure very small forces, such as van der Waals forces between molecules or a phenomenon called the Casimir effect that is due to particles popping in and out of existence everywhere in the universe." These forces are measured in "piconewtons," a trillionth of the weight of a medium-size apple. "If we are trying to investigate or exploit picoscale phenomena like Casimir forces, van der Waals forces, the hydrogen bond forces in DNA, high-density data storage or even nanoassembly, we need much higher precision and accuracy than conventional methods provide," Clark said. "With conventional tools, we know we are sensing something, but without accurate measurements it is difficult to fully understand the phenomena, repeat the experiments and create predictive models." Self-calibration also is needed because microdevices might be exposed to harsh environments or remain dormant for long periods. "Say you have a MEMS sensor in the environment or on a space probe," Clark said. "You want it to be able to wake up and recalibrate itself to account for changes resulting from temperature differences, changes in the gas or liquid ambient, or other conditions that might affect its properties. That's when self-calibration technology is needed." For example, by measuring changes in an electronic property called capacitance, or the storage of electrical charge, Clark is able to obtain the microstructure's shape, stiffness, force or displacement with high accuracy and precision, he said. "We can measure capacitance more precisely than we can measure any other quantity to date," he said. "That means we could potentially measure certain mechanical phenomena more precisely by using MEMS than we could by using conventional macroscale measurement tools." The researcher will use the new approach to improve the accuracy of instruments called atomic force microscopes, which are used by nanotechnologists. "The atomic force microscope, which jumpstarted the nanotechnology revolution, is often used to investigate small displacements and forces," Clark said. "But the operator of the tool cannot precisely say what distance or force is being sensed beyond one or two significant digits. And the typical operator knows even less about the true accuracy of their measurements." Purdue operates about 30 atomic force microscopes, and Clark's research group is planning to teach users how to calibrate their instruments using the self-calibrating MEMS. He also plans to use his new approach to create a miniature self-calibrating "AFM-on-a-chip," dramatically shrinking the size and cost of the laboratory instrument. "Such an advent should open the door to the nanoworld to a much larger number of groups or individuals," he said. 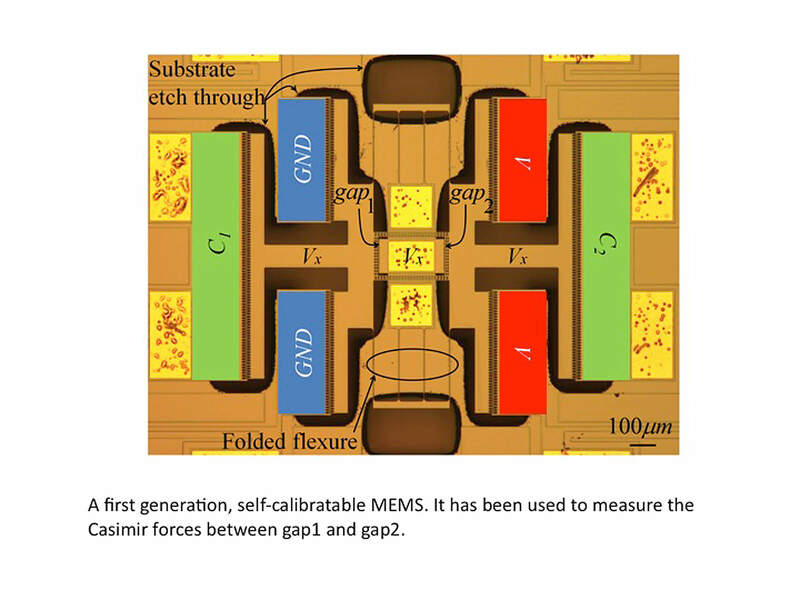 Clark's research group has fabricated and tested the first generation of self-calibrating MEMS, and repeatable results have shown the presence of the Casimir and van der Waals forces. We present a theoretical analysis of a packagable method for calibrating the force and displacement of a micro electro mechanical system (MEMS) that is subject to geometric and material property variations. Property variations are usually due to variations in the fabrication processes, packaging, and environmental exposure. Force and displacement are among the most important fundamental mechanical quantities for investigating, discovering, and exploiting micro and nanoscale phenomena. However, finding a practical and traceable method to accurately and precisely measure the minute forces and displacements in MEMS has been elusive. One reason is because the force generated by MEMS is quite often smaller than the force that can be measured by conventional force sensors. Similarly, displacements in MEMS can be as small as a fraction of the diameter of an atom, which is beyond the capabilities of standard displacement sensors. Our present analysis addresses the calibration of force and displacement for MEMS comprising comb drive sensors and actuators. Our approach for calibrating force and displacement is based on the strong and sensitive coupling between mechanical performance and electronic measurands at the microscale. That is, variations in geometry and material properties affect performance, which can be capacitively measured using on-chip or off-the-shelf capacitance meters. A novelty in our analysis is the elimination of unknown properties, which allows us to express mechanical quantities and their uncertainties solely in terms of electrical measurands. We derive analytical expressions for extracting measurements of force, displacement, stiffness, and their uncertainties by electrical probing. And we show how our method is expected to a few orders more precise than convention.